Join Over 15,000 Fellow Matched Bettors in Our Free Facebook Support Group! 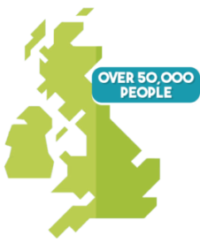 Matched Betting is followed and enjoyed by over 50,000 people across the UK and Ireland - the majority of whom had never placed a bet before starting. 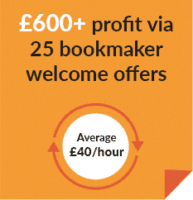 There are more than 25 online bookmakers in the UK; in total they offer over £800 in free bets to customers. Using Matched Betting we are then able to turn the £800 worth of free bets into around £600 worth of bankable cash profit. You bet on one outcome with the bookmaker and then the opposite outcome with a betting exchange. Eliminating the element of risk and yet still unlocking the bookmaker free bets. We then turn the free bets into withdrawable cash, no matter the outcome of the sporting results. Simple. 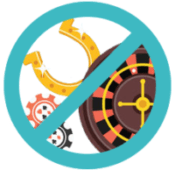 Matched betting is nothing to do with gambling, despite what the word 'betting' would suggest. Team Profit teaches you exactly how to place matched bets that turn free bets into cash profit, no matter the result of the event. Everything you need to earn £600+ with Team Profit is completely free! 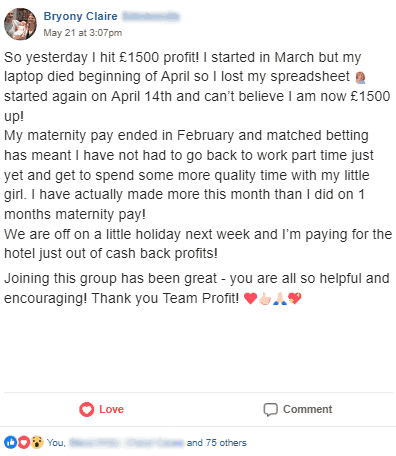 With over 15,000 Team Profit members in our private Facebook group, it really is a priceless resource for anyone starting matched betting. Ask fellow matched betters (includes our team) any questions you have, plus pick up fantastic tips and advice from ongoing discussions. 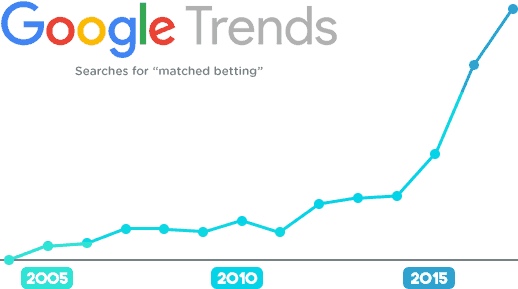 Matched Betting isn't new and has actually been around since 2005. However, it's only in the past few years that it has really exploded in popularity, thanks to sites like Team Profit making it much simpler to learn. It doesn't matter if you're a massive sportsbetting fan already or you've never placed a bet before in your life. Our simple tutorial videos will teach you everything you need to know in under 15 minutes! We make it easy for anyone to jump right in and join the most profitable team on the internet. 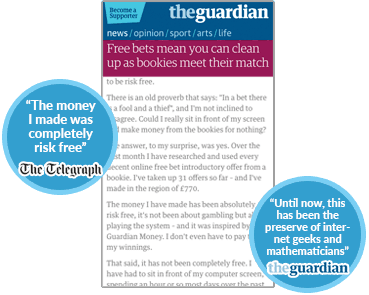 Many national newspapers and respectable online media outlets have positively reviewed Matched Betting. Agreeing that it is not gambling and will make you money in your spare time. Reviewers include: The Guardian, The Telegraph, Save the Student and Money Saving Expert. OUR TARGET is to put £2,500,000 into people's pockets by teaching at least 10,000 people how to profit from online bookmakers in 2018. 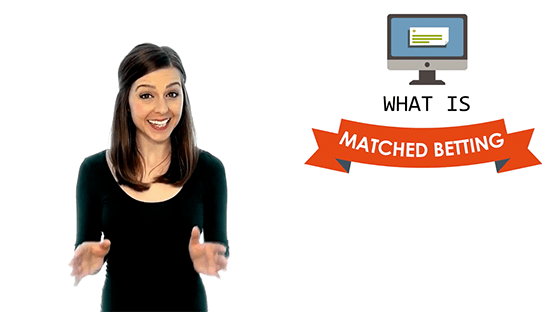 Matched betting is a technique that helps individuals profit from the bookmaker free bet offers. The reason it is called ‘matched’ is because you are matching your bookmaker bet with an opposite bet on a betting exchange. This means when you place your first bet with a bookmaker, regardless of the outcome you will win one bet but lose the opposite bet. So you don’t win from placing these two bets, but you do not lose money either. 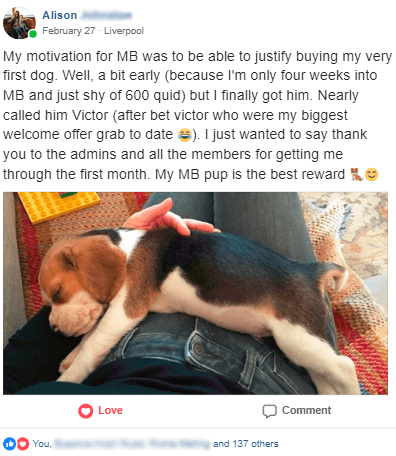 The profit is made from the free bet that the bookmaker gives us to reward us for placing our first bet with them, known as their ‘Welcome Offer’. This process is repeated across 30 bookmakers resulting in a £600 profit. Matched betting is also known as arbitrage betting, hedging or lay betting. The key difference with matched betting is that you are focusing on the free bet offers provided by the bookmakers. In the UK, we are fortunate in that it is such a competitive bookmaker landscape. This means there are over 30 bookmakers competing against each other and all offering new customer offers. You can simply sign up to each bookmaker, take up their offer and walk away with a tidy cash profit. There are existing customer offers too that you can profit from; however it is best to focus firstly on the new customer offers as these are the most profitable. 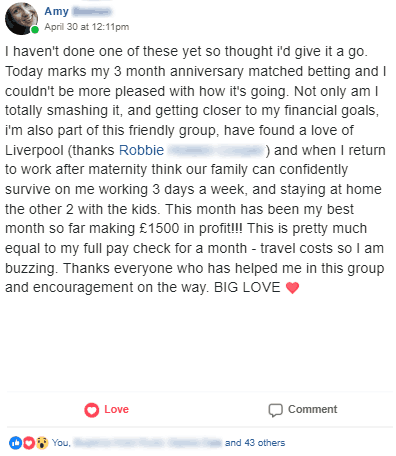 Matched betting is followed by over 25,000 people in the UK with the objective of providing an additional income each month. The range of people matched betting is very broad, including students, stay at home parents and full time employees. There are some common financial goals, most notably saving up for a holiday, pay off some debts or simply to have some extra cash for more evenings out.